United Bank of India (UBI) has come up with a new advertisement recruitment notification to recruit for Probationary Officer post through this recruitment notification. 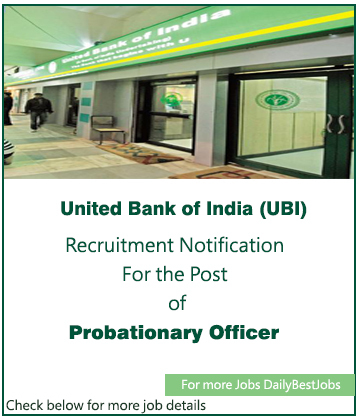 The job vacancy recruitment for the post of Probationary Officer by United Bank of India. Who Can Apply? Candidates who have completed Graduate for the post of Probationary Officer. They are planning to recruit 100 candidates for the post of Probationary Officer. The interested and eligible candidates can apply before 31/05/2017. United Bank of India (UBI) allows to receive the application from applicants by Online Mode. Eligibility: Eligible candidates can submit their application to United Bank of India (UBI) before the 31/05/2017. Find the below for more information like Age Limit, Eligibility criteria, Salary, Total vacancy, Selection Process, Job description, last date, Application procedure and other key information required for the post below. Before submitting your application by Online, read carefully all the below details for this job post. Address for the job: Corporate Office: 11, Hemanta Basu Sarani, Kolkata, 700001. (a) Those who are interested and waiting to apply for this job can apply on apply on or before 31/05/2017. (b) The selection will be made on the basis of performance by taking online test, Personal Interview and/or GD. Only satisfying the eligibility norms does not entitle a candidate to be called for written multiple test & individual personal interview. All details related to written test will be discussed to the eligible candidates in advance time. These written test will be of MCQ multiple choice questions that also mean as objective types questions. (c) The questions in objective tests except for the test of English will be printed in bilingual, i.e. English and Hindi. The candidates shall be required to qualify in each objective type examination that will be count as per negative marks if they fail to answer correct and also see the performance in each given test. There will be negative marks for the wrong answers in the objective tests. (i) The cut-off date will be 31/05/2017. (ii) The applicants make ensure that will all eligibility criteria match with respect to age limitation, education qualifications etc. as stated in this advertisement before submitting the online application form. The candidature will be cancelled at any stage of the recruitment if the applicants are not eligible. In the selection process, if you may qualifies and however if may found that he or she does not fulfill the eligibility criteria, his or her candidature will be cancelled for future updates. (iii) you can submit application only by online mode through the bank’s website. In the online application form, follow all instructions and fill accordingly. There will be no any other mode of application form would be accepted. (iv) you should be fill the form in English language only. However, at the time of the selection process, option for use of Hindi will be available. (v) No request consideration for change of center for online examination or interviews. Bank reserves the right to add or cancel any center depending upon the response in that center. (vi) you intends to indicate in the application form should have been obtained before the cut-off date, from recognized Universities or Institutions in India. (vii) The Bank may at its own rights to hold written test or interview again if something they want different for their post, so all candidates have to prepare for re-interview or retest. (viii) Without the online call letter, you would not allowed for online test and personal interview. (ix) For the ST, SC, OBC, Ex-Serviceman and PWD categories, all candidates should produce attested copy of their relevant certificate in the prescribed way from the Competent Authority empowered to issue such certificate at the time of interview. (x) The candidate’s appointment will remain same subject to his or her caste or tribe with certificates being truly verified through the proper channel and verification of other testimonials. (xi) For concession will not provide to SC/ST candidates for this job post who are already give the service in Central, State Government, Corporations or Public Undertakings or Local Government or Institutes and Panchayats. To apply for this Job Vacancy for Probationary Officer Post you should apply before the last date to apply for this job 31/05/2017. you can subscribe our job alert and receive directly to your email as daily best jobs and make end here your job search. For more daily best Jobs visit only on DailyBestJobs and all the best to applicants who will apply for this job vacancy and recruitment of United Bank of India.